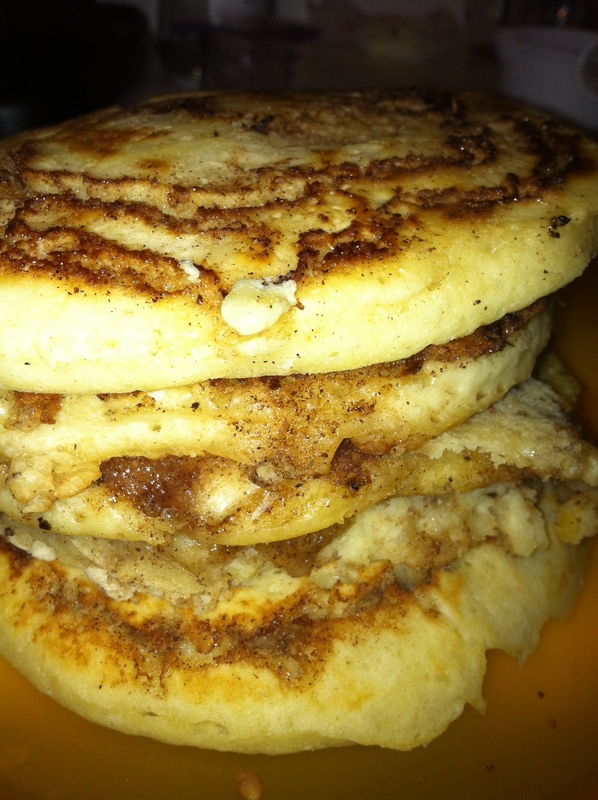 To prepare the cinnamon filling, mix the butter, sugar and cinnamon together. The butter should be in a liquid form, but not boiling. For the best results when adding the cinnamon filling, place it into a plastic squeezer. I bought mine from Safeway in the baking section for about a dollar or two. To prepare the pancake mix, just throw everything in a bowl and mix. Don’t worry if there are a few lumps, it won’t hurt the end results. Be carful not to let the cinnamon filling get to close to the edge or it will spill over. For the best results, I would recommend using a nonstick frying pan. If one is not available, make sure your pan is well coated and try and scrub off any cinnamon filling that drips onto the pan. Cook 1/3 C of pancake batter over a medium heat. When the pancake’s edges bubble, add the filling. 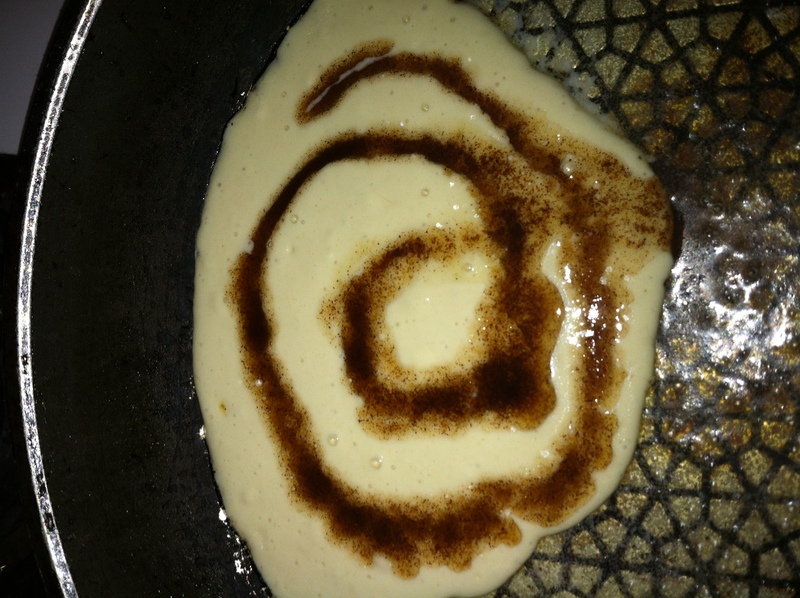 Start at the center of the pancake and swirl out in a circle. The first time I tried this recipe, I didn’t have a squeeze bottle so I ended up cutting in the filling with a spoon. It wasn’t the prettiest thing in the world but it still tasted great. I would also recommend using a thin metal spatula when flipping, the pancake might break apart at the place where the filling sits if the spatula isn’t able to get fully under it. Cook for another three minutes or so. Remove the pancake from the pan and repeat. Oh, one last thing, right before you use the cinnamon filling give, it is a good shake to make sure that everything is mixed up evenly. Thanks for ready and enjoy.